A thorough discussion of the traditional art of Japanese stencil dyeing, with slides and examples of antique fabrics and of my own work, illustrating where it has taken a contemporary surface designer and fiber artist. Karen Miller was born in Oakland, CA in 1946. She was a marine biologist before becoming an expert on katazome, the art of Japanese stencil dyeing. Using her own hand cut stencils to apply a resist paste she produces fabric for art quilts, as well as silk garments, linen hangings and indigo dyed cottons.Her work has been exhibited twice in Japan. She has shown her work in numerous juried and group shows. Her work was accepted to Visions 2002, In 2009 she had Oregon solo shows at the Newport Visual Arts Center, Benton County Historical Society and the Oregon Nikkei Legacy Center in Portland. She shows regularly at the Japanese Garden in Portland and Kobo in Seattle. 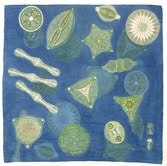 Her work is in numerous private collections and hangs in the Washington D.C. office of Jane Lubchenco, the head of NOAA. She has taught katazome nationally and internationally and published several articles on katazome. She was invited lecturer at the Museum of International Folk Art, Santa Fe New Mexico. She was featured on Oregon Public Broadcasting TV Oregon Art Beat in October 2007.